Can the Surface Pro 3 Dethrone the Mighty iPad? 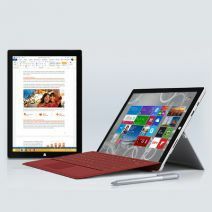 The Surface Pro 3 is the latest major release from Microsoft. It’s an impressive piece of tech with a 12-inch screen and a Core i3 processor for the base model. Microsoft hopes that the Surface Pro 3 will dethrone Apple’s iPad from its title as “King of the Tablets.” However, the two devices may be too different for the Surface Pro 3 to even compete. Even the staunchest of Microsoft supporter can’t deny the unparalleled level of success seen by Apple’s iPad, selling over 200 million units in the past four years. Meanwhile, Microsoft’s Surface Pro seemed to have a difficult time even turning a profit. According to The Register, “Microsoft spent more in a single year advertising the Windows 8 and Surface launches than it took in from Surface sales that same year.” Ouch. What makes the iPad vs. Surface Pro battle so intriguing is the fact that the Surface Pro is, and always has been, a great product. The Surface Pro is a powerful tablet that can actually do more than the iPad, thanks to its utilization of a full Windows operating system. However, it may have been Microsoft’s aggressive approach to market Surface Pro as “more than a tablet” that did it in. To give Microsoft credit, their approach in how they designed the Surface Pro seems logical and looks good on paper. “Hey guys, the iPad is doing really well. Let’s make our own tablet and make it bigger and better!” Microsoft then proceeded to design its Surface Pro to be a tablet/laptop hybrid, thinking that would be the hook consumers were looking for. Herein lies the core of the issue: Apple is very comfortable having their iPad be just a tablet, while Microsoft tried to do more, thus isolating consumers that were in the market for “just a tablet.” As it turns out, if a consumer wants a tablet, they’ll buy a tablet, and the same can be said about a laptop. The biggest problem is Windows. The operating system and its applications are designed to use a keyboard and a mouse at a foundational level. You simply need those devices. Microsoft knows that, of course, which is why it has often bundled pens with its tablets as mouse surrogates and why it has more recently offered the Type Cover snap-on keyboard, an accessory that’s optional only in name. What those accessories leave you with, of course, is a laptop. All Microsoft has done is deconstruct the laptop into several pieces you have to reassemble to work properly. Lastly, software is a key factor in the battle between iPad vs. Surface Pro. Apple designed its iPad apps to be unique for the iPad. These iOS-exclusive apps work well with touch screen and there’s no need for a keyboard. It also helps that Apple now has four years of developing these apps under its belt. This sets up the iPad nicely for continued success. Whereas Surface Pro uses the same software as desktops, which doesn’t always make for a smooth transition to the small screen, as seen with Adobe Photoshop having its icons displayed almost too small to even be used for those of us with clumsy fingers. We should also note that it’s been a while since we heard anything from Microsoft about Windows RT. Windows RT isn’t officially dead, but silence from the software developer is equivalent to a death sentence. This is a shame because Windows RT has the best potential to directly compete with iOS. Is it Fair to Even Compare the Two? We don’t know exactly what the future has in store for the next chapter of the iPad vs. Surface Pro battle. However, the result here may be that it’s not really fair to directly compare these two devices due to their fundamental differences. As much as Microsoft would like its Surface Pro 3 to be the iPad killer, the Surface Pro looks to be too different to effectively compete in the tablet market. Microsoft fans, don’t get us wrong, the Surface Pro 3 is an amazing all-in-one device that can benefit businesses in many ways. It’s just fundamentally different from Apple’s iPad. What’s your opinion on the new Surface Pro 3? Do you prefer iOS, Windows, Android, or other? Share your thoughts with us in the comments! Toronto IT Support / Tektonic Blog / Technology / Can the Surface Pro 3 Dethrone the Mighty iPad?